No. 20 on Slotsgade, dating from 1835, has all the guise of a Classicistic building, but hidden behind its facade is a half-timbered house from circa 1577-80, built by the eponymous Philip Skiferdækker (slater"). Originally, this was a front-gabled house, meaning that the gable was street-facing. In extension of the gable, a building was added with a heavily projecting 1st floor giving onto the courtyard. This floor was supported by beams and carved braces. The house fell into disrepair but was restored in 1976-80. The restoration work revealed fascinating decorations, notably painted panels from the mid-1600s. Today, the building houses the Louis Ehler ceramics collection. " 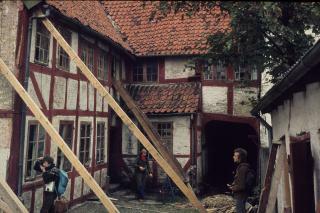 Philip Skiferdækker was for many years one of Denmark's most skilled slate-roofers. Originally from Cologne, he arrived in Haderslev circa 1560. Laying slate and tile on towers and spires required all the arts of the trade. Skiferdækker, a master of those arts, was contracted in 1571 for construction of Duke Hans's new castle in Haderslev, where he worked until his death in around 1610. Duke Hans, younger brother of King Christian III, parcelled out the old castle estate, selling off the plots to favoured courtiers. In 1577, Philip Skiferdækker received the deeds to the site of No. 20 Slotsgade, where he built his house. In appreciation of Skiferdækker's skill, the duke awarded him the second-highest pay among the artisans and courtiers. He was also granted tax exemption and free ale delivered to his door.